Good performance with productivity applications; Slim and portable; Crisp audio. Poor display; Slows down with anti-virus installed. 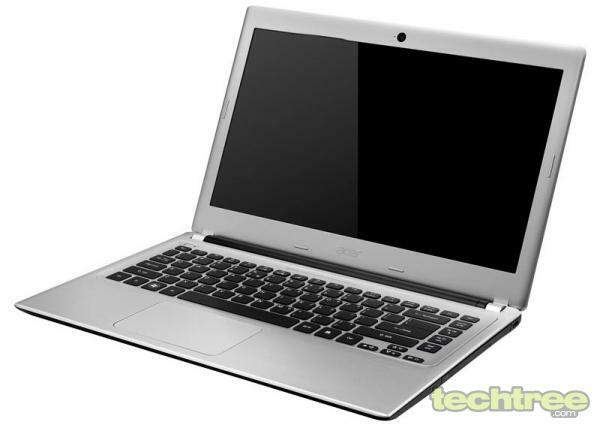 Ultrabooks have recently been making headlines with their slim bodies and attractive styling. However, these gadgets have been prohibitively priced, thus limiting access to only the moneyed. Thankfully, Acer has attempted to give consumers the best of both worlds, by combining a slim form factor with attractive pricing in its new Aspire V5 series of laptops. We have the V5-431 with us today, so let's find out if it stands a chance in this cutthroat market. The first thing that leaps out at you is the slim profile of the V5-431, with a thickness of just 0.9" (23 mm) and a weight of 2.1 kg. The 14" 1366x768 LCD is just 6 mm thick at the bezel, and can open up to 160° wide. An HD webcam is present at the top to facilitate video chat. The body is constructed out of plastic, with a dull metallic finish on areas such as the bezel and keyboard palm rest. Overall, the build quality appears to be cheap, especially due to the fake aluminium. The keyboard is of the island type (aka "chiclet") with well spaced-out keys that offer good tactile feedback, making it comfortable to type without mis-strokes. Since this isn't a full-sized keyboard, there is no separate numeric pad, which is a downer. Moreover, the direction keys are a bit too small, adding to the inconvenience. The <F1> to <F12> keys also handle special functions using the <FN> modifier key, such as switching between displays, toggling the Wi-Fi, and multimedia functions. This arrangement is much better than some retarded designs that invert the assignments so that you have to press <FN> in order to use the regular <F1> to <F12> keys. Finally, <ENTER> has been made larger so that you don't miss this oft-used key, while the spacebar is of perfect length. Strangely though, indicators for the all-caps and numeric locks are absent. The touchpad is large, with dimensions of 3.75" x 2.5", and is designed to appear somewhat like that of a MacBook, with multi-touch capabilities, scroll zones, and no apparent buttons. It has been intelligently placed a little to the left, thus reducing the chances of the palm accidentally touching it. However, this might make it slightly inconvenient for left-handed people. A DVD-RW drive is situated on the left-hand side of the laptop next to a Kensington lock, while an MMC + SD slot has been provided at the front, adjacent to LED indicators for AC power and hard drive activity. Two USB 2.0 ports and one SuperSpeed USB 3.0 port, marked by a blue interior, have been placed on the right-hand side of the laptop. They are accompanied by an HDMI port and a single 3.5 mm jack for headphones and microphones. Ventilation grilles are also present, in addition to an expansion port that comes with a supplied adaptor cable for both Gigabit ethernet (RJ45) connectivity as well as a D-Sub VGA port for regular monitors. One plus point here is that the USB ports allow charging of devices such as mobile phones and PMPs even when the laptop is switched off. The V5-431's DDR3 RAM can be upgraded from the default 2 GB to 8 GB (two slots only) by opening the panel at the bottom. The laptop comes with a 4-cell replaceable Li-ion battery, which powers a 1.5 GHz Intel Pentium 987 dual-core CPU based on the Sandy Bridge micro-architecture, designed to consume lesser electricity. A 500 GB, 5400 rpm hard drive takes care of data storage, while the graphics subsystem is handled by Intel HD Graphics with shared system memory. Intel Pentium 1.5 GHz dual-core 64-bit CPU with 2 MB cache. 2 GB DDR3 RAM, max up to 8 GB (2 memory slots). Multi Media Card (MMC) \ Secure Digital (SD) Card slot. 500 GB Serial ATA HDD @ 5400 rpm. WXGA 14" (35.6 cm) Active Matrix TFT Colour LCD with CineCrystal technology, 16:9 aspect ratio, LED backlight, HDCP-enabled. Intel graphics controller with shared system memory. Atheros WB222 Wi-Fi 802.11 a/g/n, Gigabit ethernet, Bluetooth 4.0. 1 x HDMI, 2 x USB 2.0, 1 x USB 3.0, VGA and LAN (RJ45) through supplied adaptor cable. 64-bit Windows 7 Home Basic, Microsoft Office Starter (reduced-functionality Word and Excel only, with advertising. No PowerPoint or Outlook), Bing Bar, Windows Live Essentials. 4-cell (Li-Ion) 2500 mAh battery, 4 hour run time. 0.9" (23 mm) (h) x 13.5" (w) x 9.6" (d), 2.10 kg approx. Package contents: Aspire V5-431-987B2G50Mass notebook, Lithium ion battery, AC adaptor, VGA and LAN adaptor cable. The overall performance is decent and as expected of the low-power 1.5 GHz processor. However, it does slow down noticeably with an anti-virus installed. Also, no heating issues were encountered for the entire duration of the review. 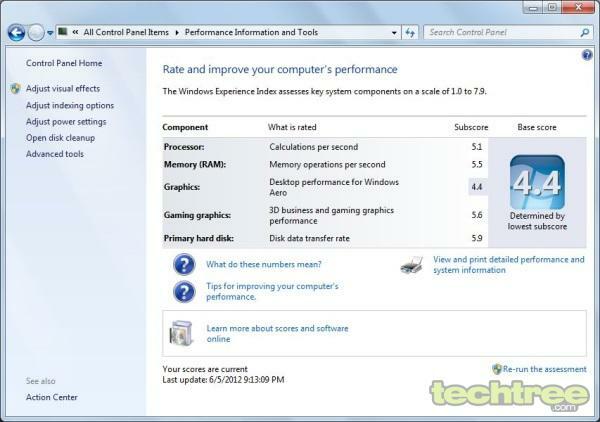 Here are the results of a few synthetic benchmarks. 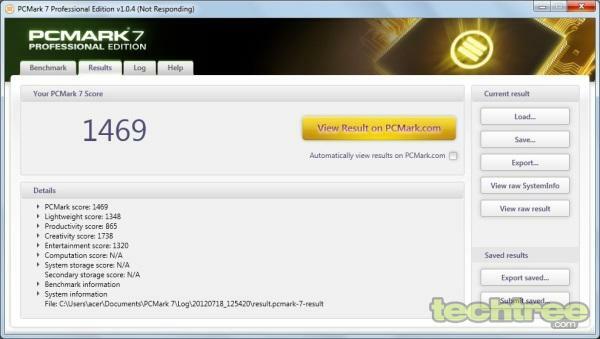 The PCMark 7 score is indicative of a computer system that is easily capable of serving as a desktop replacement for productivity (office-based) applications. However, the graphics are not powerful enough for high-end gaming, though you can still play casual games in the office when the boss isn't watching. The 14" screen displays faded colours, and its contrast is also poor. Viewing fast-paced action movies is not an issue though, thanks to the fast response time. However, the panel is plagued by extremely narrow viewing angles, which means that colours cannot be viewed uniformly across the entire display from any viewing position. This problem is even more pronounced when it comes to the vertical viewing angles. On the other hand, the V5-431's audio performance is exceptionally good, despite its understandably limited bass component. The sound is very clear, with crisp, audible vocals. Thanks to the Dolby certification, the speakers present an excellent soundstage, with the audio seemingly enveloping you — something quite unexpected from a pair of speakers placed less than 30 cm apart. Overall, the laptop exhibits excellent positional audio performance. I measured the 2500 mAh battery's real-world performance with Battery Eater Pro and by actually using the laptop on the Balanced power scheme in Windows 7. The utility runs a Reader's Test that simulates a real-world e-book reading scenario (scrolling at a slow rate down a long text file), while the Classic Test uses OpenGL to simulate heavy usage such as gaming. The battery lasted for a shade over 3 hours in the former and nearly 2 hours in the latter. In my actual use test, I performed regular tasks such as using a word processor, surfing the internet using Wi-Fi, and firing up the occasional music track and video clip. The laptop lasted barely beyond 3.5 hours, thus confirming that while it's good enough to take out occasionally, it cannot match the considerably longer battery backup offered by ultrabooks or Acer's own TimelineX series.